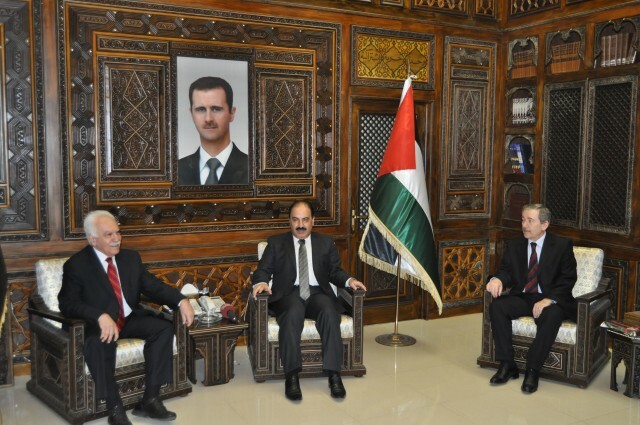 The Chairman of the Patriotic Party Doğu Perinçek met with Hilal Hilal, the Secretary General of Syria Regional Branch of the Ba'ath Party on Sunday. 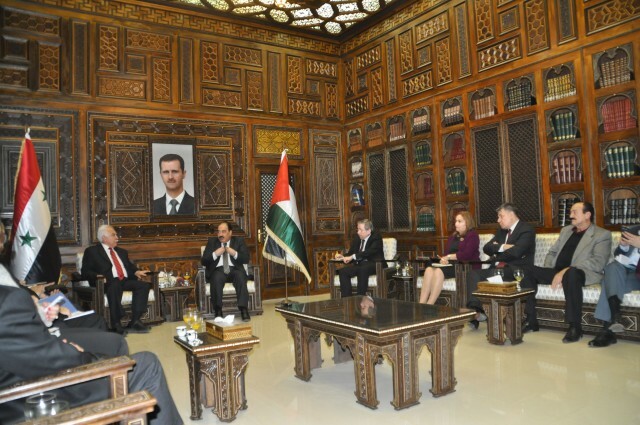 The Patriotic Party delegation visited the headquarters of the Ba'ath Party in Damascus on Sunday. Turkish delegation's visit to the party attracted the attention of Syrian media organs. "Turkish government stole the will of people"
"We know very well that you came to Syria under difficult conditions and we also know what kind suppressions you will face when you go back to your country. However, Turkey and Syria are in need of eachother because of the common history and neighboring relations." "The people of Turkey desire good relations with their neighbors but the current government of Turkey stole the will of the people. However we all know that the people are always permanent while the governments are temporary." "Today, Syrian people ask themselves why Erdogan's government supported terrorism despite the developing economic, cultural and social relations between the two country?" "We would like to see the Zionist camp and supporting countries behind these attacks but we were really surprised when we see Turkey behind the curtain." "But I'm sure that the history will write down the glorious resistance of the Syrian Arab Army. We are committed to end up terrorism." "We know that you have very deep ties with Turkish people and your party represents a great tradition throughout the Turkish political history." "We know that you pay a great attention to secularism. You represent modern Turkey while Erdogan and his accomplices still not give up the neo-Ottomanism ideology." "And our conviction is that the Turkish Republic established by Ataturk will not be destroyed that much easy." "We feel at home here"
"We feel at home here. We came as the Turkish delegation. The power that combines us is the indepence and integrity of Turkey and Syria." "President Assad is proved with this resistance that the imperialism can be defeated. The Greater Middle East and Northern Africa was project was wasted with your fight. They were aiming to split 24 Muslim countries but they could not." "We will unite the people of the region"
"Syria's territorial integrity is Turkey's territorial integrity. We definetely reject the export of terrorism towards Syria." "We will unite the people of the region. Because we have a common future. If Turkey, Syria, Iraq and Iran get united, they would become an invincible force." "Today's most important issue is the ethnic, secterian and religious terrorism promoted by the USA and Israel." "We promise our friends that a Syrian-friendly government will be established in Turkey soon. This is the primary need of Turkey. The government of those who have no loyalty to their neighbors will be destroyed." "The unity of the regional countries will provide a great economic prosperity to all of us. The unity of Turkey, Syria, Iraq, Iran and Azerbaijan will complement each other with 'five sea - five countries' project." Fomer Turkish Deputy Prime Minister Abdüllatif Şener: "I was criticized by Syria when I resigned from the AKP." The founder and the Fomer Turkish Deputy Prime Minister Abdüllatif Şener also spoke at the meeting. 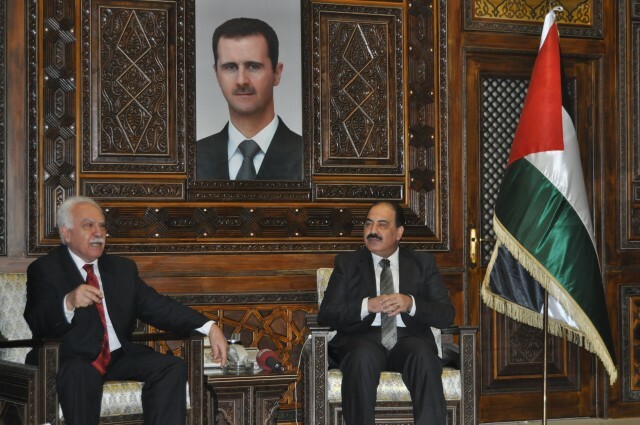 Şener said, "I am delighted to be here and to be invited by the Syrian government. I served as the Deputy Prime Minister of Turkey between 2002 and 2007. I always worked for the brotherhood of the two nations and I was one of the first who thought that Turkey's Syrian policy was a big mistake. When I resigned from the AKP in 2008, my Syrian friends were harshly criticized me. Today, I sincerely believe that the terrorist groups will be destroyed and Turkish and Syrian governments will be everlasting forever." Hilal "The USA aimed to bring down Syria"
Secretary-General of the Ba'ath Party Hilal Hilal said that the source of the attacks towards Syria is the USA. Hilal also said "The USA calls Syria as 'the rough state'. Former US FM Colin Powell came to Damascus in 2004. The Iraq was invaded by the US army at that time and Powell said President Assad that the engines of the US tanks are still hot. He asked us to deport Palestinian groups and to end our strategic cooperation with Iran. He wanted us to leave the Resistance Front. We rejected all of his demands. Then they launched the schemes against Syria. Their target is to destroy Syria. Because Syria is an independent country out of USA's control. "Let me say the thing to be said at the end in the beginning. Our Kurdish brothers are an indispensable part of the Syrian society and an overwhelming majority of the Kurds do not support Rojava project. However, some particular groups linked to the PKK got an aim like this. There is no chance of the realization of this project in Syria."